So, it's been a month-long road ... which is impressive in itself if I consider that I was completely against the idea of the Kindle for a very long time and never imagined myself a convert. To be clear, I'm not a gadget person. Not. At. All. Although I'm moving to a place mentally where I can justify certain gadgets due to how much I actually use things ... like after my big refusal to move to the Blackberry, this year I actually plan to upgrade myself to a Samsung Galaxy SIII. Because I've realised that the problem my head has paying so much for such a tiny device (although it is somehow okay with spending 5K on a laptop) is ridiculous when I consider how much I use my phone (especially in comparison with said laptop). Although that said I haven't managed to convince myself that it's worth upgrading my laptop although it drives me crazy with how slow it is ... but I just don't use it that often honestly. So anyway, I did consider the Kindle debate back before I went on the Trans-Mongolian Railway ... but opted instead for good old fashioned books. But I quickly realised the error of my ways once on the train. I was limiting myself to 200 pages a day to make the 3 books I'd taken last. And that left me with nothing to read for the remainder of my trip in China. And 3 books in my luggage I couldn't part with (although I love the idea of the swap libraries in hostels around the world ... I like owning certain books). Then when I got back it seemed silly to get one. Since I never really know what my next trip is gonna be and I had no immediate need. But I started thinking about possibilities for holidays this year and when I was considering a Mediterranean Cruise, it seemed like another good idea ... and when I packed 2 books to keep me busy on my flight to Cape Town and back over December it definitely seemed like the way to go! 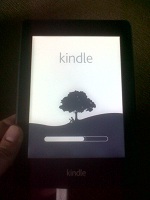 I decided just before I left for Cape Town that I'd buy myself one. Then I discovered that, while Amazon is probably the best place to actually buy a Kindle, I wanted the Paperwhite (newest technology while I'm at it and all) and they would NOT ship that to South Africa. They won't even let you get to the check-out. It was very disappointing. So I searched a bunch of the South African sites and they were all far more expensive than Amazon (with the currency conversion) would've been. I found the cheapest price on Have2Have, it was about R1500. I was sold! But I decided that because their estimated delivery date meant it'd probably arrive while I was still in Cape Town, but if it was even a day late, I'd be back in Joburg, I'd wait a week and order when I knew for sure I'd be back in Joburg to receive it. Silliest move I've made thru this process, honestly. 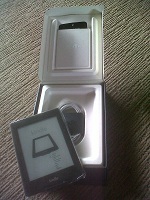 By the time I was ready to order my Kindle Paperwhite from Have2Have, their delivery dates were screwy. In fact they still are. The site currently says: Delivery Estimate: Saturday 02 March 2013 to Monday 15 July 2013. I mean really? That must be the vaguest concept of a delivery estimate I've ever seen in my life. There was not a chance I was going that route. I monitored it for a week or two. Because, let's face it, it's not an urgent purchase for me. Then their price fluctuated up to R1946. Which put it back on a par with everyone else in SA selling one. But there did seem to be a stock shortage. So on Monday I decided to just bite the bullet and give up waiting for Have2Have to fluctuate back to the lower price and a reasonable delivery date and I found someone selling it on Bid or Buy. Now I haven't used Bid or Buy in ages, but I've never had a problem buying on it. But I'll admit I was a little nervous with this kind of item. The seller, wecangetit, has a fantastic 100% positive rating and it's made up of plenty of previous purchases. AND (most importantly) he had 3 in stock of the model I wanted. Sold!